Not that it’s really a breakthrough, anyone would consider trying this out with another tablet, but the credit this 10.1 inch Note tablet from Samsung gets when Brussels Philharmonic decides to go mainstream with Galaxy Note 10.1 as their tool of trade wouldn’t go without being noticed. 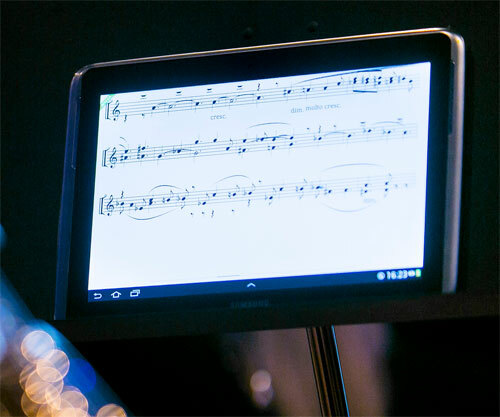 Samsung partnered with Brussels Philharmonic to replace orchestra’s music paper that has been in use for eons with the tablet. 100 16GB Galaxy Note 10.1 tablets are now in use and are preloaded with neoScores software. The Galaxy Note 10.1 comes in handy with the appendage that is the S Pen which will be used for changing and correcting notes. It also features a concert mode to avoid interference during the concert and page sweeping is enhanced for ease of use. This will save Brussels Philharmonic upto 25,000 in paper and tape, that’s technology adoption for you. Samsung is keen on making the Note series stay ahead of the peers by showing users how well an advantage the S Pen poses, and applications made specifically for use with it.